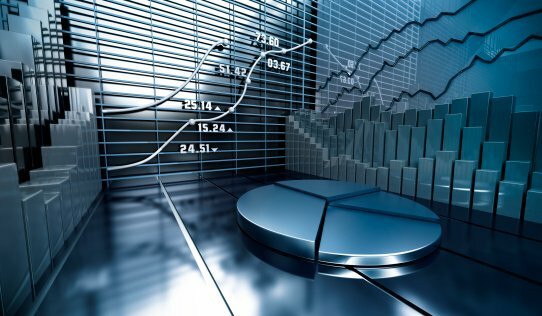 One of the most important concepts in investing is that nominal macro-economic and company-specific data is only made relevant to investors when it is considered in contrast to what expectations existed for the data prior to its release. This is because securities are discounting mechanisms that are priced based upon what data is expected to be in the future rather than what it is today. For example, if a company is expected to announce spectacular earnings and earnings results meet expectations, the company’s stock price is very unlikely to gain value, as spectacular earnings would have already been reflected in the company’s price. If anything, share prices might actually fall somewhat in such a situation, as investors have historically shown a tendency to “buy the rumor and sell the fact”. Similarly, if expectations are for the release of a high inflation number, and that expectation comes to pass, it is unlikely that bonds would lose value since that expectation for a jump in inflation would already be reflected in bond prices prior to the announcement. It is normally only when expectations diverge from future reality that markets tend to make substantial moves in either direction, which is what historically makes complacent and over-confident markets so dangerous, as much of the potential good news is already reflected in securities prices, and that leaves very little potential for positive surprises, albeit with significant risks if the data does not meet lofty investor expectations. 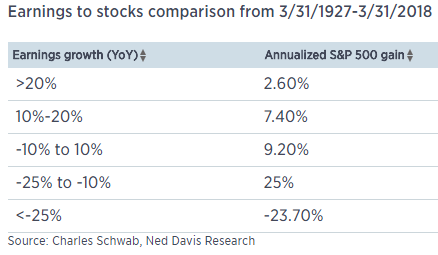 This explains the remarkable conclusions of a recent report done by Ned Davis Research and Charles Schwab, which shows that the only time when stocks perform worse than when corporate earnings are growing at more than 20% (as is the case today) is when earnings are falling by more than 25%. To wit: such spectacular earnings growth normally occurs very late in market cycles when, as noted, most of the good news is already priced in, when there remains very little potential for upside surprises, and when there is abundant potential for significant disappointment. Since markets trade on this differential between expectations and reality, we thought that it would be a useful exercise to look at the fundamental issues that are of utmost importance to today’s investors, and to try to get a feel for how efficiently today’s securities prices are discounting the evolving outlook for future fundamental data. For this we will turn to a just-released Bank of America survey of 231 institutional portfolio managers with $663 billion of assets under management. This survey, which was taken during the July 6th to July 12th period, showed that 60% of respondents viewed a trade war as the biggest risk to the equity markets. This represents a dramatic jump from the only 31% of respondents that listed a trade war as their greatest concern in June. It is also the highest “tail risk” assigned by this survey to a single factor since the European Union debt crisis in 2012. Indeed, the only other concern that more than 6% of respondents listed as a primary risk was that either the Federal Reserve or the European Central Bank would become overly aggressive in their transition from a stimulative monetary policy to a restrictive one. This was listed as the primary risk to the markets by 19% of respondents. Since 79% of respondents quite reasonably listed one of these two factors as the market’s primary potential downside catalyst, we will concentrate the majority of this writing on these two factors in general, and how the markets are currently pricing in the trade policy-related risks in particular. It is no wonder that trade-related issues dominate this survey. 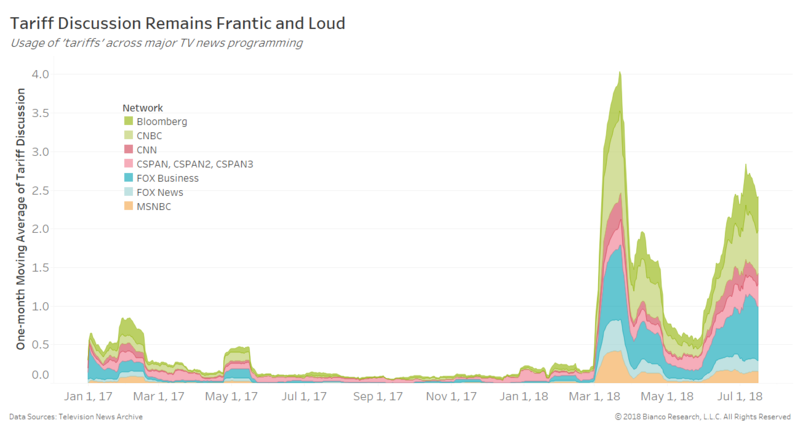 They have been a primary topic of discussion and reporting across virtually all major domestic news sources since March of this year and have been a mainstay of our writings for months. 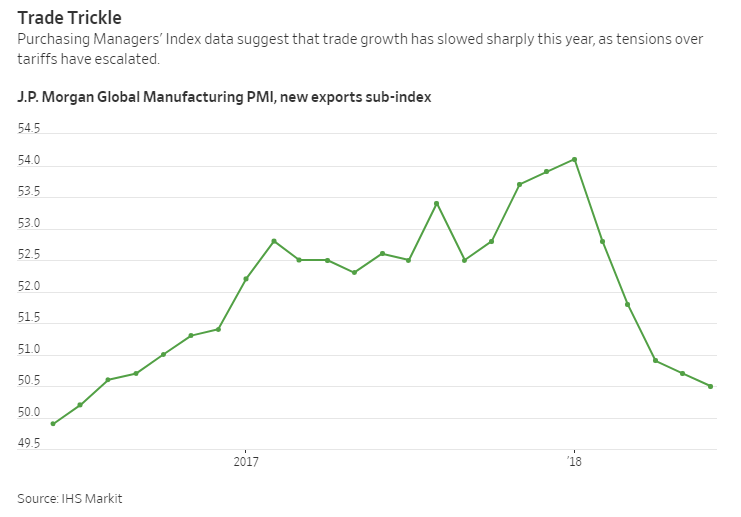 If anything, such extensive coverage suggests that current trade issues are well known to investors and thus already at least partially reflected in securities prices. Indeed, there is evidence that institutional managers are already responding to these heightened risks in increasingly substantial ways. 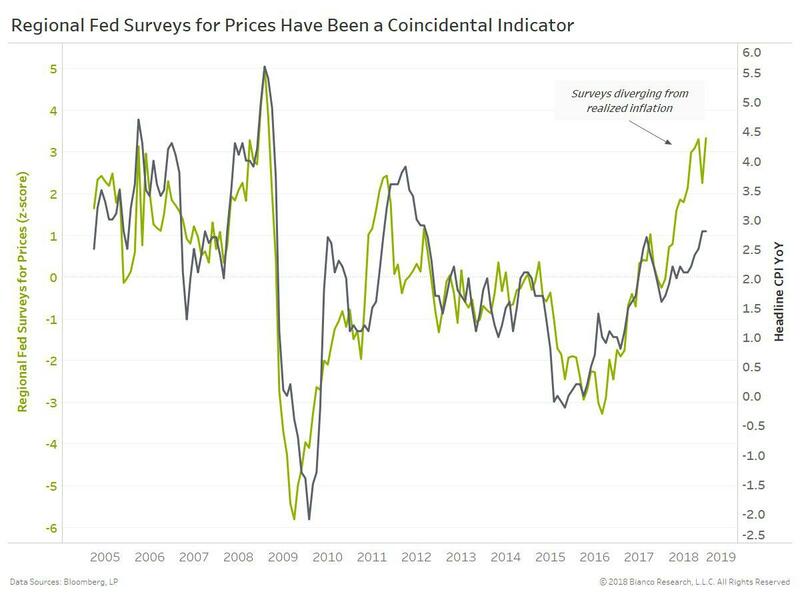 As a case in point, the money managers participating in the aforementioned survey noted that they had lowered their global equity allocations by an average of 14% just since the June survey, so markets are clearly adjusting to the macroeconomic changes. These trade conflicts are also starting to impact the real economy, as illustrated by the Federal Reserve Beige Book (a collection of anecdotal evidence compiled from businesses in each region of the country), which noted that “Manufacturers in all districts expressed concern about tariffs and in many districts reported higher prices and trade disruptions that they attributed to the new trade policies.” Indeed, the mere anticipation of tariffs and trade restrictions has been significantly impacting trade flows since the beginning of the year. This is despite the fact that the actual implementation of tariffs has been very measured thus far. 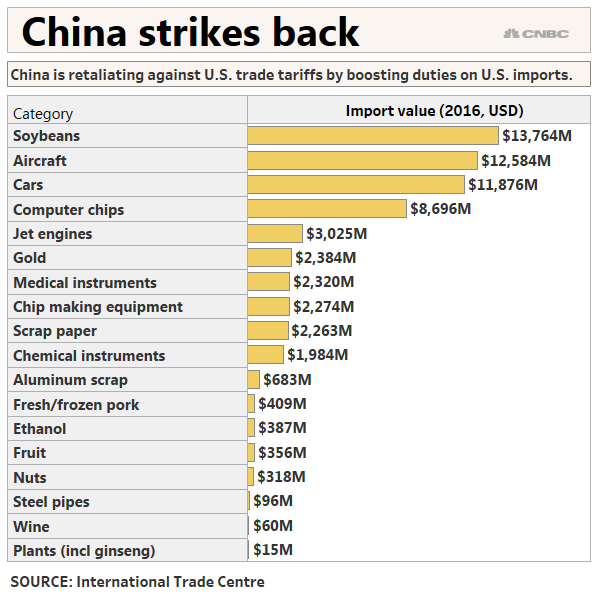 There are tariffs on steel and aluminum imposed by the U.S. and then countered by our trading partners and a modest $34 billion of tariffs imposed by the U.S. against China, which China also countered. Moreover, if you look at the tariffs that the Trump administration has imposed to date, they have clearly been crafted in a way that is designed to insulate the consumer from any direct pain, because the largest tariffs are going to primarily impact businesses (i.e., profit margins). Indeed, estimates are that the increased annual cost to the average American family resulting from the limited tariffs already implemented would only be around $60, and even a family making $160,000 per year would see a modest cost increase of only $141. Furthermore, even if 20% tariffs were imposed on $1 trillion of global trade (i.e. about 5% of total world trade, and a larger sum than currently threatened), it would only raise the world weighted average tariff from the current 3% to 4%, which suggests that the direct impact of existing tariffs on the U.S. economy should be modest in the short run. The problem with such an optimistic interpretation is three-fold. 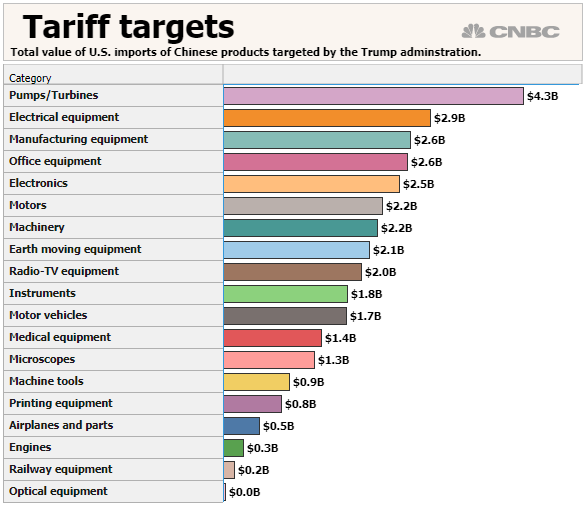 First, the scale of the trade conflict keeps escalating, with the U.S. now threatening automobile tariffs against Europe and a tariff on the entire $505 billion of goods imported to the U.S. from China. With each escalation causing changes in the expectations for future economic and company-specific data, the markets must continue to adjust prices accordingly. 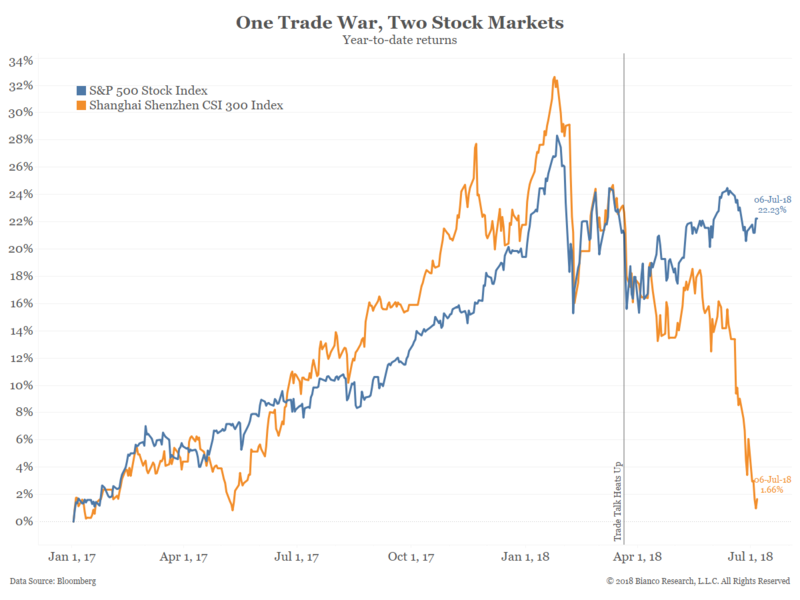 The second issue is that the growing risk of a full-blown trade war changes investor and company behavior well in advance of actual changes in trade policy, which causes damage regardless of the eventual outcome. 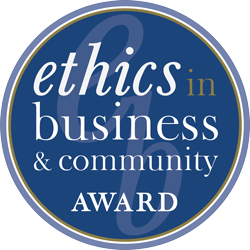 Indeed, it is increasingly clear that uncertainty is already motivating many companies to use funds originally ear-marked for productivity-enhancing capital spending (the Business Round Table reports a 7.8% drop) to instead repurchase their own shares (a quarterly record of $437 billion). This hurts longer-term profitability but enhances current earnings per share. The third issue, which also played out as a consequence of the 1930 tariffs, is that it realigns trade relationships. While the U.S. is off alienating all of its major trading partners, they are all starting to form trade partnerships with each other that exclude the U.S. Indeed, the European Union is now pushing for a free trade deal with China after having just concluded negotiations on a huge trade deal with Japan that covers over 600 million people and a third of the global economy. In short, President Trump is proving rather successful in facilitating a world of lower tariffs and freer trade. Unfortunately, the way that things are going, the U.S. may find itself on the outside looking in. Moreover, if China were to successfully attempt to fill the role in the Trans-Pacific Partnership that the U.S. walked away from, the U.S. could be left at a significant disadvantage. In regard to the number two concern that the central banks would unwind monetary stimulus too quickly, we consider that to be only a secondary risk at this time. 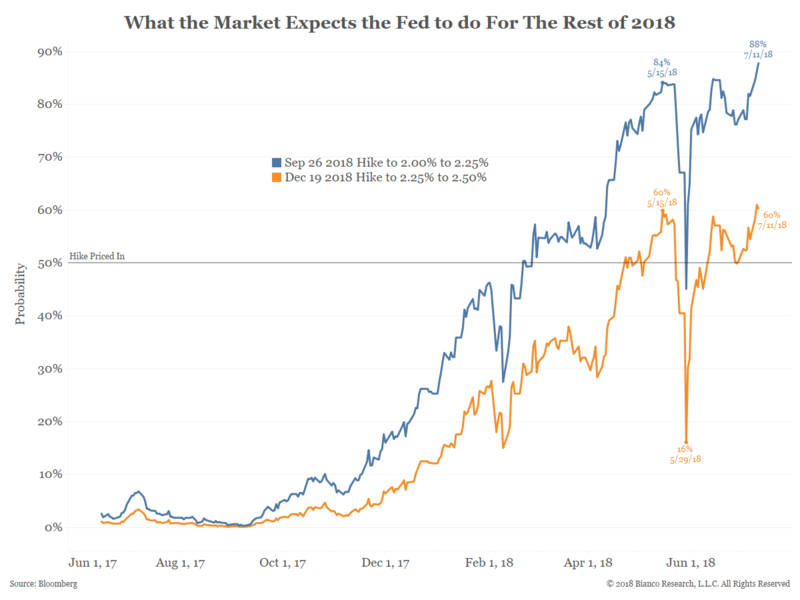 According to research firm Gluskin Sheff, if the Fed simply adheres to the guidance that it has provided regarding balance sheet shrinkage and rate hikes, it will be tightening the equivalent of a massive 5.25% increase in the Fed Funds Rate (from the bottom), which is dramatically higher than the historic cycle average of 3%. However, we are coming from a condition of excessive monetary and fiscal stimulus. In addition to the trillions of dollars in credit created by the Fed and the years of near-zero percent interest rates, the Trump administration has introduced an estimated $800 billion of fiscal stimulus ($200 billion of tax cuts, $100 billion of new spending and $500 billion of profit repatriation) into an economy that is already running at full capacity, where the labor pool is shrinking at an 11% rate, and where available job openings on a national level exceed the number of available workers (allowing for the fact that there are still 95 million working-age Americans not actively seeking a job and relatively little immigration to alleviate the labor shortages). It is no wonder that Fed Chair Powell is putting increasing pressure on the brake as President Trump pushes hard on the accelerator. With some estimates of current U.S. growth already running as high as a blistering 4%, Powell is just trying to keep the car from going too fast to control. However, higher interest rates don’t just slow the economy, which is directly contrary to Trump’s objectives. They also put upwards pressure on the value of the U.S. dollar, which makes Trump’s tariff-based trade strategy less effective. To explain, if the U.S. imposes a 10% tariff against a country whose currency then falls by 10% (either via market forces or currency manipulation), Americans would see virtually no change in the price of imports from that country, and there would thus be no reduction in consumer demand. With dollar strength therefore muting the impact of the tariffs, and higher U.S. interest rates further strengthening the dollar, Trump has, over recent days, initiated the practice of using interviews and tweets to jawbone the Fed to slow the current course of monetary tightening, while simultaneously talking down the value of the dollar. 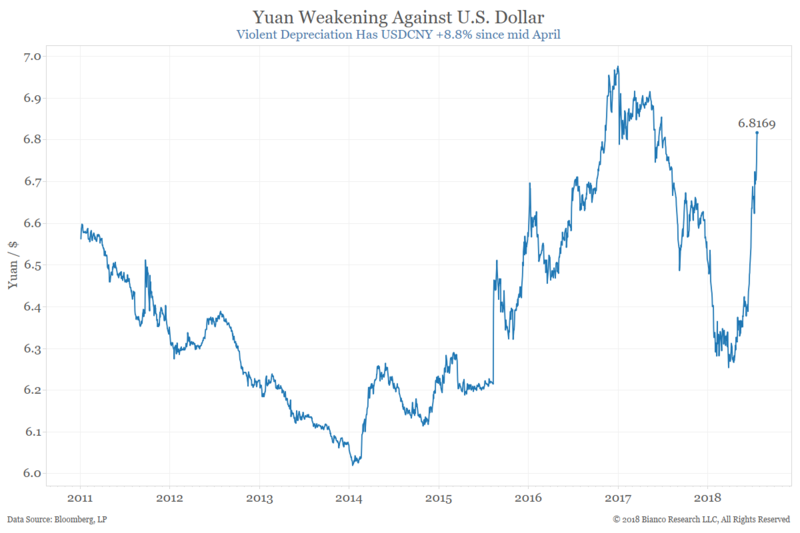 Unfortunately, Trump’s recent statements reflect a poor working knowledge of macro-economics, as the very imposition of tariffs is probably more of a catalyst for a higher dollar than are the modestly higher U.S. rates he is criticizing. Moreover, through his jawboning of the Fed, Trump is probably assuring that monetary tightening will be more aggressive than it otherwise would have been, as President Trump has placed the Fed in a position of potentially needing to demonstrate its independence from political pressure. If the Fed were to transition to a less aggressive course now, even if they otherwise wanted to do so, they probably could not, as it would be perceived as evidence that the Fed had succumbed to political pressure, which would likely forever damage the credibility of the Fed as an institution. Another factor that could increase the likelihood that the Fed would want to slow the pace of monetary tightening is that, with long-term interest rates remaining so low, the Federal Reserve runs the risk of inverting the yield curve (i.e. raising short-term rates higher than long rates) which could cause a recession by making it unprofitable for banks to lend money. One of the unique ironies of the current situation is that it is likely that the uncertainty being created by President Trump’s trade policies is largely responsible for keeping long-term rates down thus risking a yield curve inversion and threatening the sustainability of the American economy that Trump is working so hard (and accumulating so much national debt) to stimulate. By both attempting to compromise the independence of the Federal Reserve and introducing the idea of employing the dollar as a weapon in a trade war, President Trump has introduced two new and potentially very dangerous elements into what is already a highly combustible mix. In our opinion, if he continues along this path, he will significantly increase the likelihood that this trade conflict will get out of hand and have unintended and potentially draconian impacts on investor portfolios. Unfortunately, that does not seem to be a concern to President Trump who has already expressed his comfort with the idea of investors “feeling a little pain”. This was reaffirmed last week in a CNBC interview when he noted that, “We are playing with the bank’s money”, which somehow assumes that recent stock markets gains are a gift from the President that investors would be pleased to give back in the name of improving America’s trade balance, an obvious fallacy. 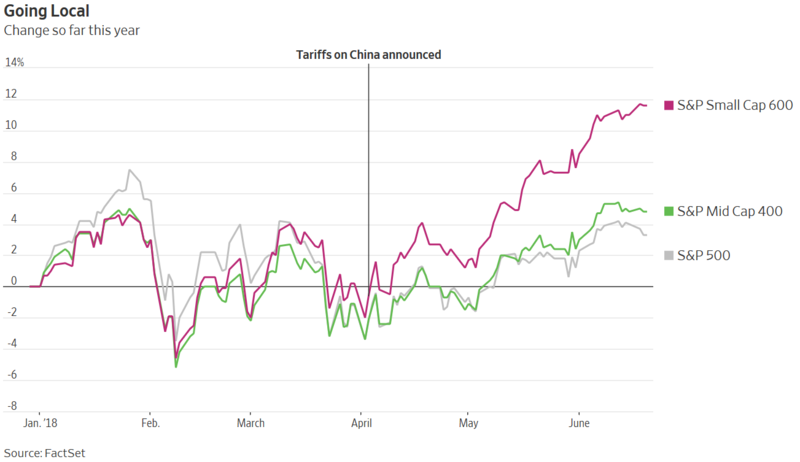 On the positive side, because the trade issue is already foremost in everyone’s mind, it would be reasonable to expect that its likely impacts are already in the process of being priced in, which does seem to be the case, as exemplified by the relative performance of the assets that would be most susceptible to a trade war versus those that are less so. 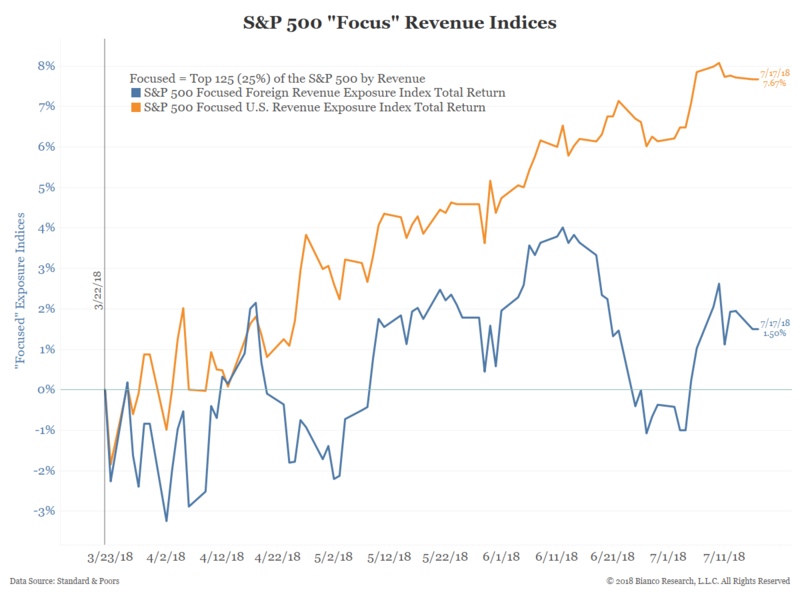 This can be seen in the relative performance of smaller company stocks, whose underlying companies are less susceptible to trade restrictions and dollar strength, and which cater to a domestic consumer. It can also be seen in the outperformance of domestically-oriented, large capitalization companies over those that are more export dependent. The lesson seems clear, which is that the markets are differentiating between winners and losers based upon the implications of trade, and history suggests that the markets are almost always “right”.